Oh yes, you read that right: Gluten-Free Mini Matcha Mille Crepe Cake. 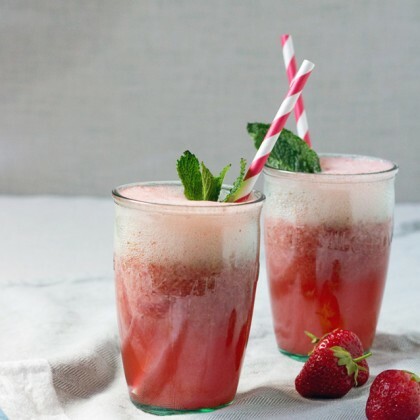 Queenie came up with this fantastic recipe and yup, it tastes as good as it looks. First, let’s start with the crepe cake. 1. In a bowl, combine rice flour (3/4 cups) and sugar (4 teaspoons). 2. In a saucepan, gently melt and heat the butter (3 tablespoons) and 3/4 cup of milk. Do not bring to a boil. Take off heat when most of the butter has melted and set aside, letting it cool down so it’s lukewarm. 3. Pour the melted butter/milk into the rice flour bowl. 4. Add eggs (2) and mix well. 5. Add in 1 tablespoon of cold milk, and mix. At this point, the crepe batter can be used right away or be kept in the fridge to be used the next day. 6. Heat up a 6″ cast iron skillet (like this one) on medium heat. Once heated, wipe a thin layer of oil using a paper towel. 7. Take a small ladle of crepe batter and pour in from the center and quickly swirl the batter around to coat the whole pan. After about 45 seconds, loosen the edge of the crepe using an angled spatula and flip. Cook the other side for about 30 seconds. Thinner the crepe, the better. 8. Transfer the crepe to a plate to cool. Repeat, again and again. Next, the matcha cream filling. 9. In a bowl, mix together rice flour (1/2 tablespoon), cornstarch (1 tablespoon), egg (1), vanilla extract (1 teaspoon), and sugar (1 tablespoon). 10. Heat milk (2/3 cup) in a saucepan over low heat and bring to a simmer. Take off heat. 11. Pour the milk into the egg mixture bowl a little at a time. Mix well. 12. Pour the contents of the bowl back into the saucepan. Heat over low heat and whisk until it starts to thicken. 13. Remove from heat and continue whisking until the mixture looks smooth, like pudding. 14. Pour the cream into a bowl and lay a plastic wrap directly on top. Cool in the fridge for about 10 minutes. 15. Mix together hot water (1 tablespoon) and matcha (1 tablespoon). 16. Add in sugar (1 tablespoon) and honey (1 teaspoon). Mix well. 17. 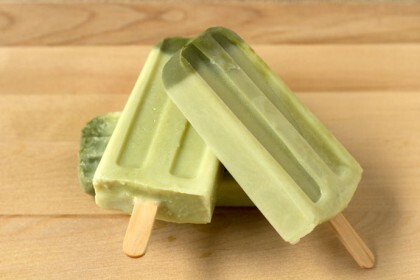 Take the cream out of the fridge and mix in the sweetened matcha. 18. Slowly add in heavy cream (1/2 cup), little by little, and whip until it reaches medium peak. 19. Using a 2″ or 2 1/4″ cookie cutter, cut circles out of the stacked crepe cake. 20. Put the same cookie cutter on a small plate and use the cutter as a mold. Place a crepe circle at the bottom of the cookie cutter. Take a small spoonful of matcha cream and cover the first layer of crepe. Place another crepe circle on top of the matcha and keep alternating layers of crepe and matcha until it reaches the top of the mold. The top layer should be matcha. 21. With the mold still on and on the plate, place in the fridge for about 5 minutes to set. 22. Take a crepe circle and sprinkle one side with sugar. Use a culinary torch to caramelize. Make 12-14 more caramelized crepes. 23. Take the mold with the crepe cake out of the fridge. Unmold by placing a crepe circle on top and push down while pulling the mold up. 24. Remove the top crepe circle and replace with a caramelized one. 7. Take a small ladle of crepe batter and pour in from the center and quickly swirl the batter around to coat the whole pan. After about 45 seconds, loosen the edge of the crepe using anangled spatula and flip. Cook the other side for about 30 seconds. Thinner the crepe, the better. Gorgeous! I can taste the matcha just looking at that colour! Waiting for your matcha recipe book! Is the rice flour in think recipe a white rice flour or glutenous rice flour? Hi Mallory, the matcha we used from Aiya had such a vibrant color! Hi Georgia, haha, maybe one day…. Hi Lina, we used Thai rice flour, which it seems like is just white rice flour, not glutenous. Hi Pip, unfortunately there are dairy products in this recipe, although it is gluten-free. Thanks so much for your compliments! The recipes do take a while to put together. Oh MY! As a person that is eating a gluten free and dairy free diet, I recently gave a review of the Matcha Green Tea here in Australia and was looking for recipes to use the rest of it. These look AMAZING and what can I say, the effort you go into with your post is admired and appreciated by a fellow blogger 🙂 Have a great day. Smiles, Pip. Is it can if i assemble the big cake first the cut into small pieces? Hi Hanna, yes, you can cut the big pieces out first then cut into the smaller sizes. A FREE matcha – green tea recipe eBook is also available with purchase on Amazon. Email LIAN.HAVRO@junnipponmatcha.com to receive your individual $2 off coupon. This is an awareness promotion and when the supply runs out, the promotion will end. Hi Ben, yes, it is meant to be served cold! You can leave it out for 5-10 minutes after you take it out of the fridge before serving if it’s too cold. Hi yours are amazing. I never had good result since I tried baking. I live in South Korea. Can I buy your recipe book online? and where can I find it? Hi SJ, I don’t have a recipe book for you to buy, but I have a downloadable ebook you can get for free. 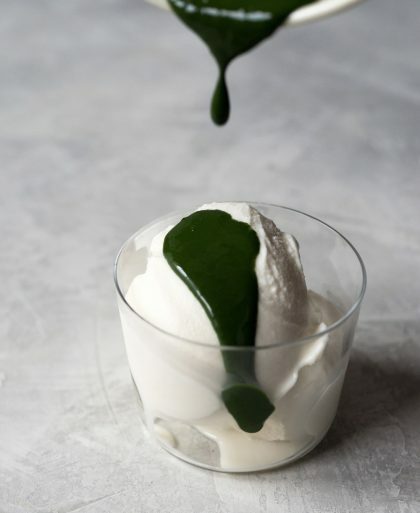 Scroll up to “Get My Top 8 Matcha Recipes!” and put in your email address to get it!